Find your chosen type of membership in one of the two tables below and click on the appropriate price. Complete information about membership and courses can be found in sections of the site of the same name. The system prompts you to enter personal identification number/ID (rodné číslo) and then click on the button to check whether or not you are a member of the club. Existing member in the displayed form checks, eventually adjusts his contact information, a new member shall complete all the given fields. 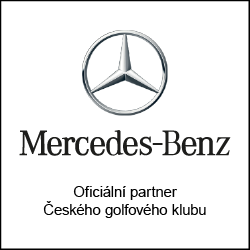 If you are a new golfer, without registration in the Czech Golf Federation, in the HCP section of the form, check the box "bez HCP". Check and agree to 4 statements. By checking "Pay online by credit card" and after correct submission of your registration, you will be forwarded to a payment gateway for online payment of the CGK membership fee. After you click "Send registration", if all data is filled out correctly, the system will display a confirmation and reception of your registration, on the contrary, if the form above is not filled completely and / or if only one of the form is not confirmed, the system will displays an error message asking for the missing data and after filling out the forms correctly, you will receive a confirmation of your registration. In case that online payment by credit card was not chosen, then, please pay your membership fee to the appropriate membership type you selected, either in cash at the headquarters of the club (only possible by prior arrangement), or to a bank account 10810808/5500. Input relevant CGK member’s ID number/ personal identification number (Rodné číslo) without slash in the column for Reference (Variabilní symbol). If you are a new golfer, without registration in the Czech Golf Federation, send scanned certificate of aptitude test (green card) by email to zc.kgc@ofni . No later than the third business day after appropriate membership fee has been recieved, you become a member of our club, and you will be sent a confirmation email. From this day when you become a member, you can also use all the membership benefits offered under your specific type of membership.